The garden area for this town-home runs down the side and faces the street to the south. Sharing the space are 2 large A/C unit. 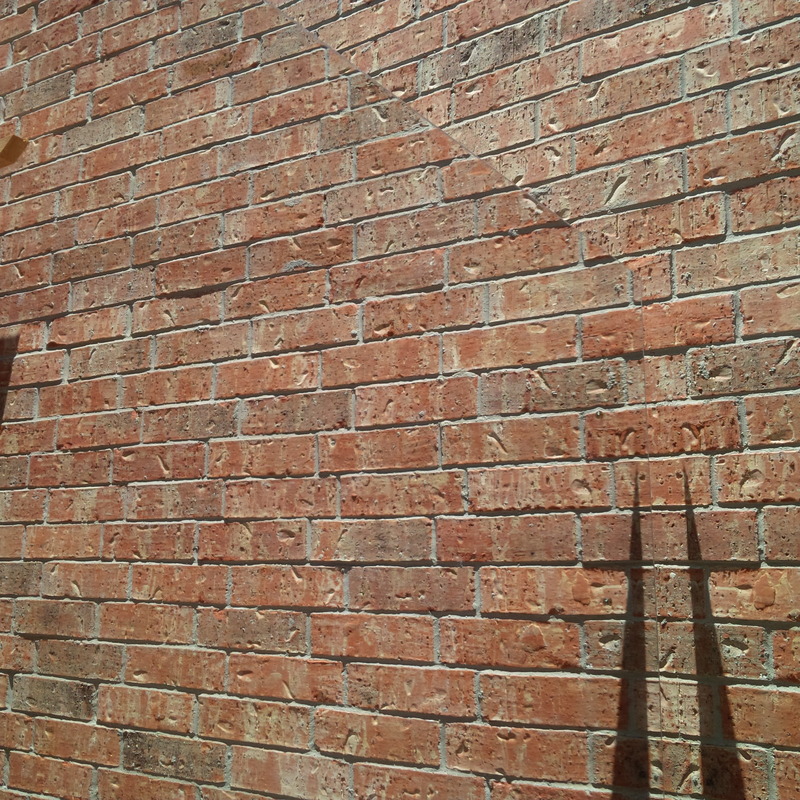 We have been working on a brick patio and pergola that is accessed from the family room. There will be a raised herb and veggie bed on the other side of the path which will also have a brick facade. 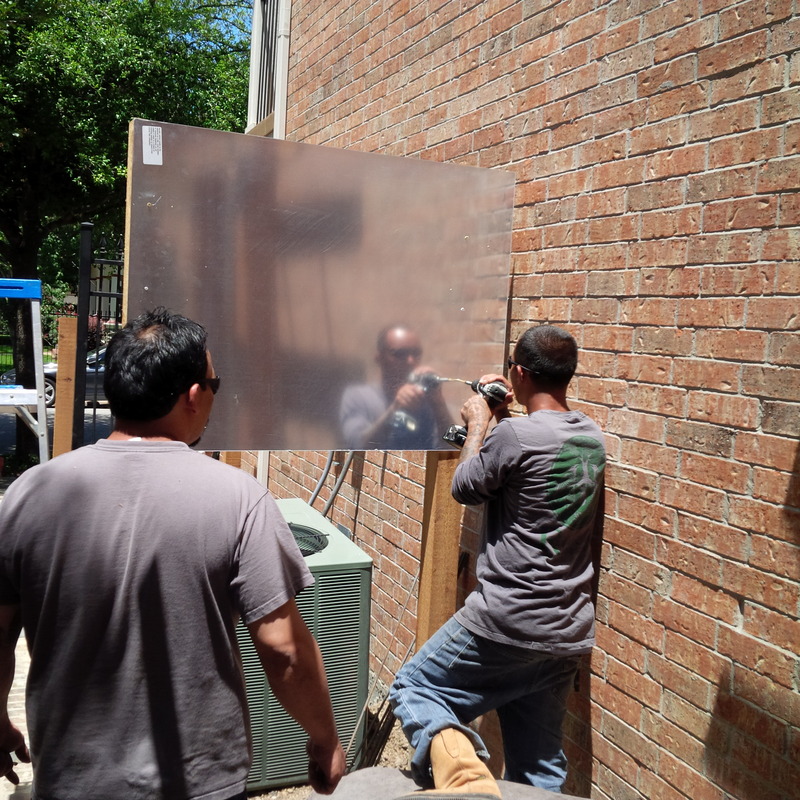 The posts are in for the mirror screen and the A/C screen. 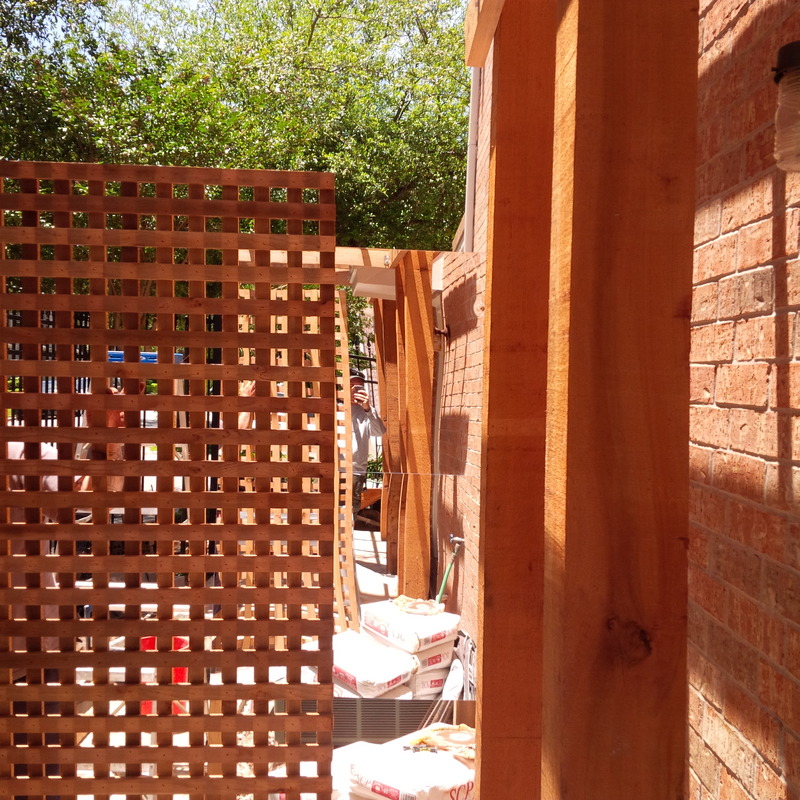 We often build wooden screens around A/C units that are in prominent view from entertaining spaces. 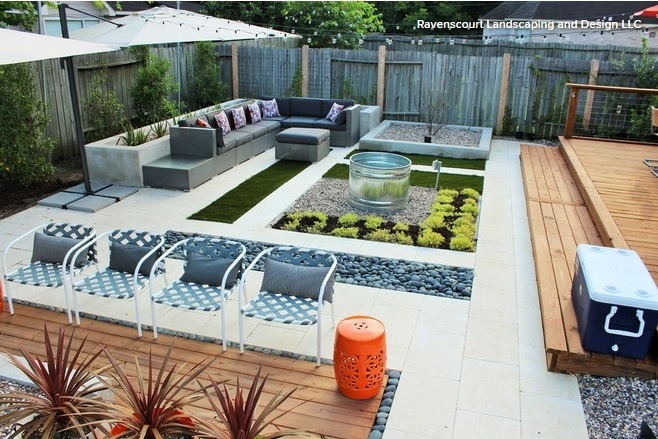 In this garden we are installing a tiered fountain in the space between the units and the entertaining space. I had to get creative figuring out a good way around these monsters! 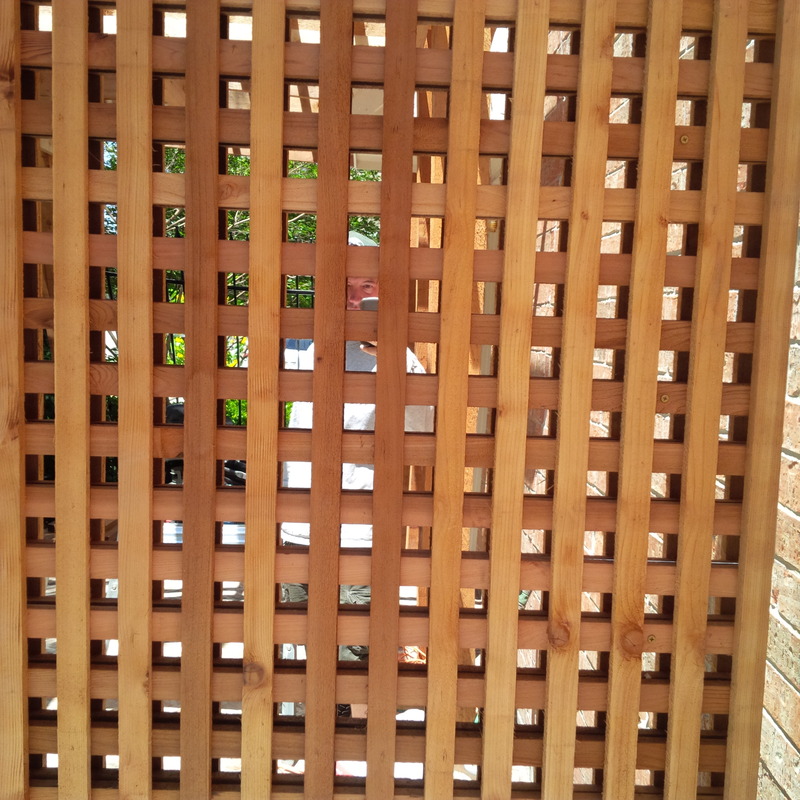 It finally struck me, it would be fun to do a lattice screen with a mirror behind it. This creates more of a sense of space and obscures the A/C further. The sounds of the fountain will hopefully mask or blend with the hum of the A/C. We set the posts, earlier in the week, to allow them time to set/cure before we began to attach any weight. It is important to get them plumb and accurately space so ever thing that attaches to them lines up. Any variation would be very evident. Once we measured the distances from center of post to center of posts we pre-drilled the mirrors. We uses progressively larger drill bits to make sure that we did not crack the mirror. Attaching the acrylic mirror to the cedar posts. 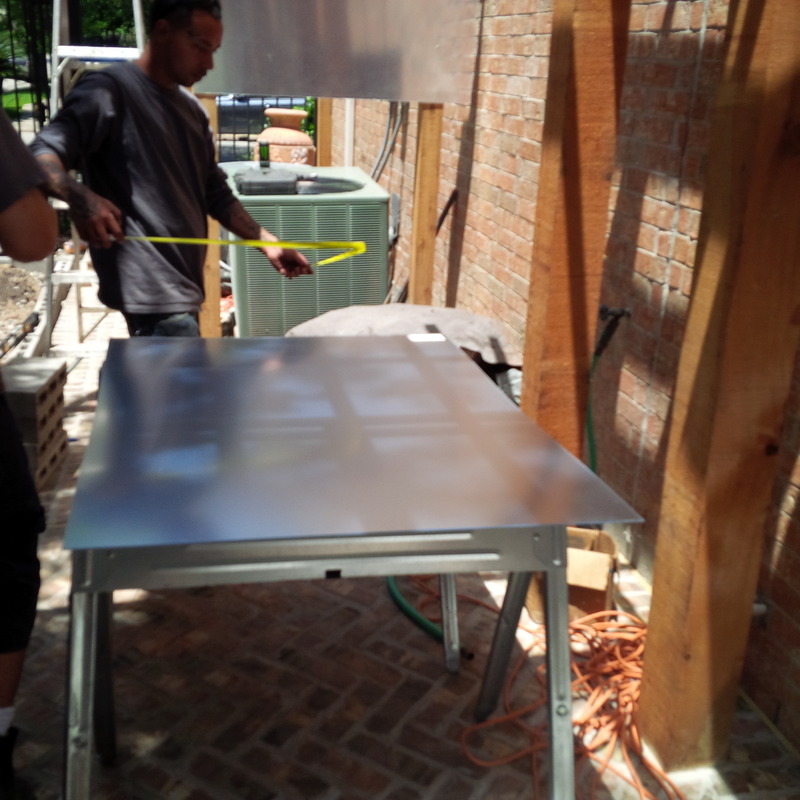 The mirrors come with a protective coating onto which we marked our drill points. You can see the one in the back already mounted. We only made three anchor points for each mirror on each post knowing that we were going to fasten the lattice atop it. The fewer holes the less chance of cracking the materials. With the protective coating removed you can see just how clear they are. 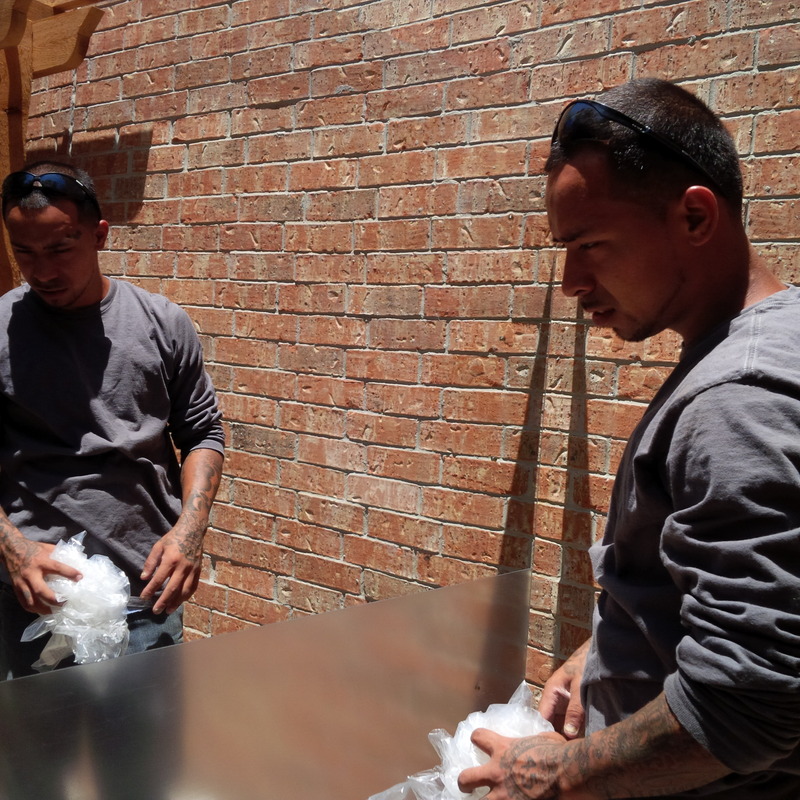 The same worker looks like his twin pondering a foggy tabletop. Is it twins or a mirror? 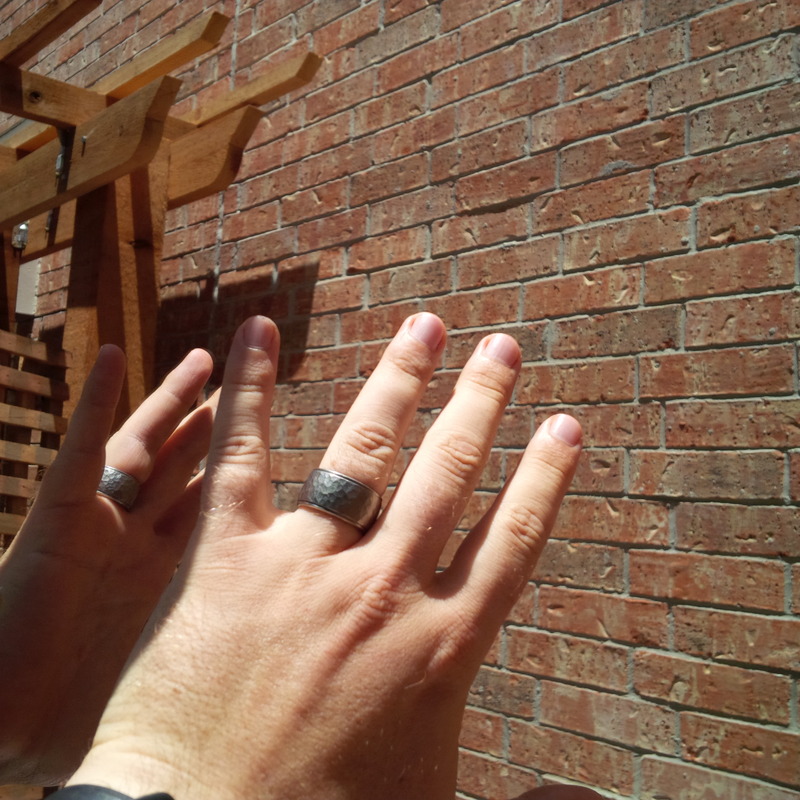 Shawn’s hand in the mirror, the pergola is actually behind him. Figuring out how to construct this wasn’t too difficult. Sourcing the outdoor mirror took some research. I finally found acrylic mirror panels at Home Depot online. They are remarkably clear and we were able to screw through them to attach them to the cedar posts. 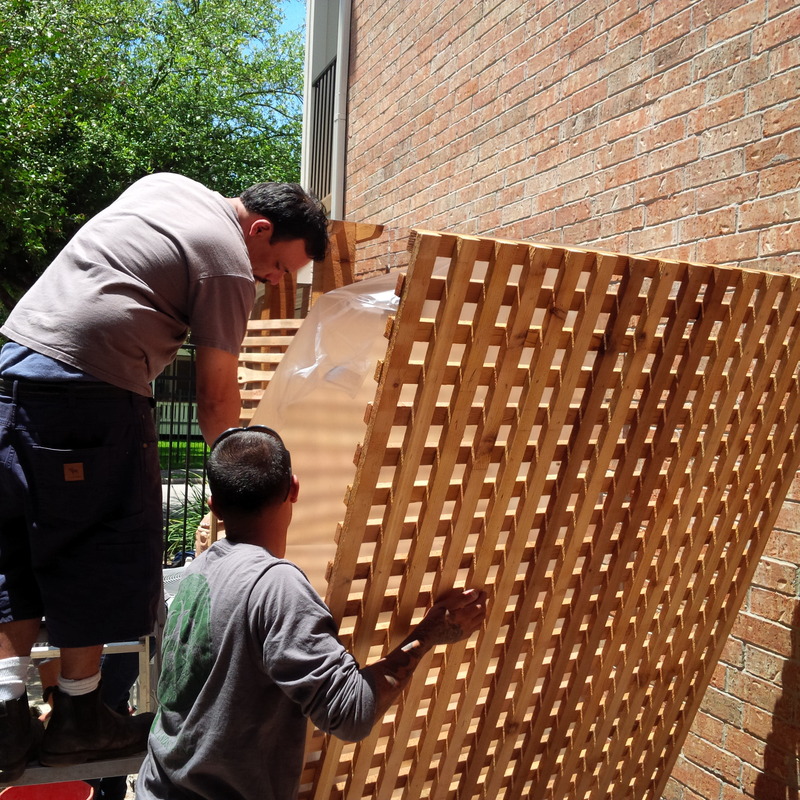 Here we are moving the lattice back out of the way after using it to check where we will put our drill-holes. The protection on the top mirror is just coming off. Below you can see the lattice and the now-assembled mirror. The distortion is most evident where the two mirrors abut. 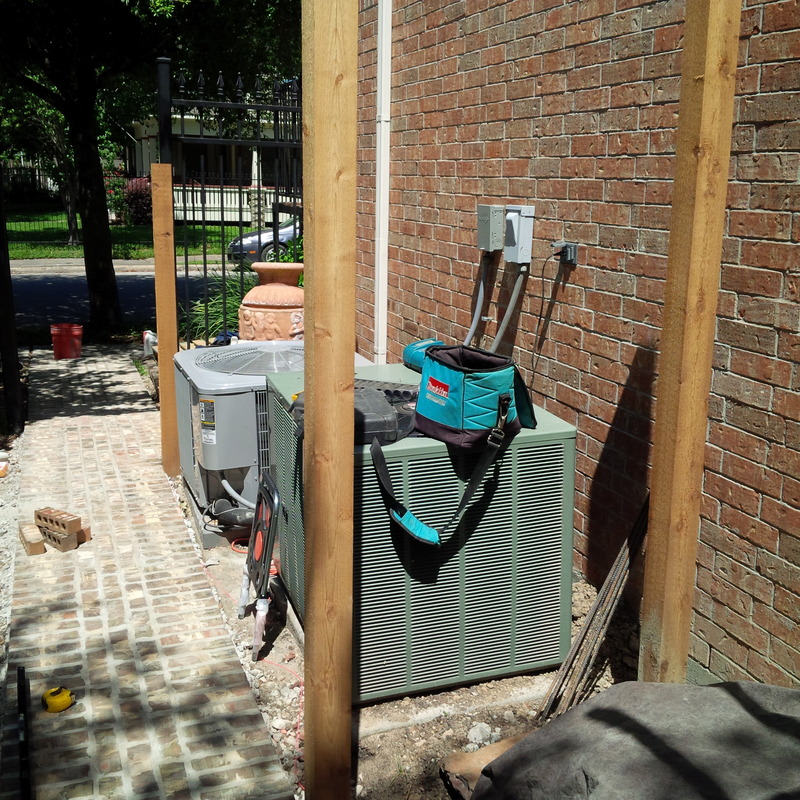 Now that the main panel is assembled there is a nice shield and the AC units do not have to be viewed from the comfort of the patio. We look forward to installing the fountain this coming week as well as building the raised bed. 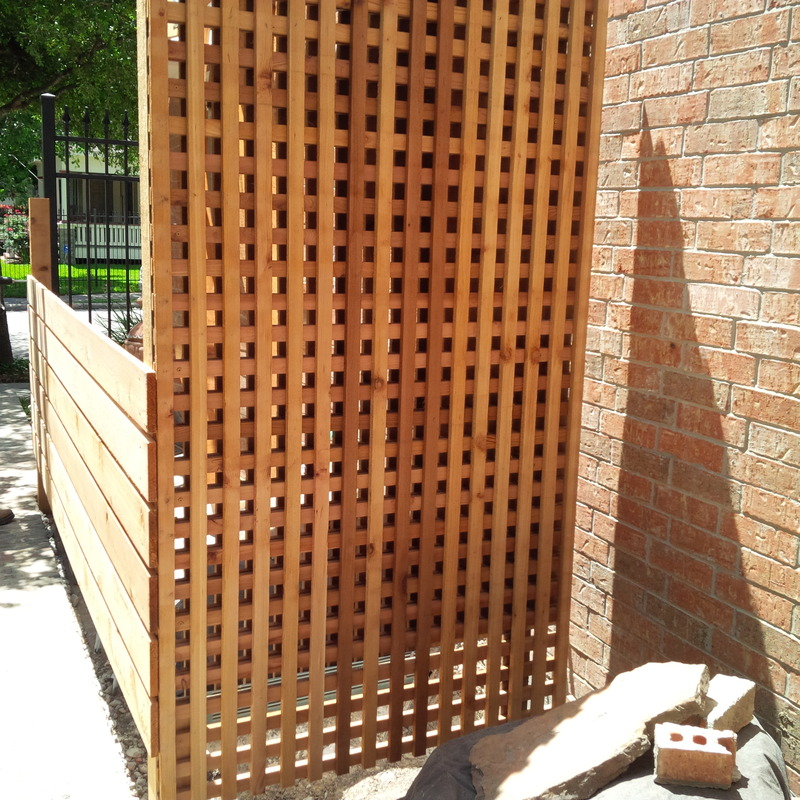 Finished cedar and mirror screen. Next the fountain and plants. We will have more on this project when we are finished!